A number of previous studies have yielded conflicting results as to whether serum total homocysteine concentration (tHcy) is associated with diabetes mellitus or with variables of the insulin resistance syndrome [1–15]. In order to test the null hypothesis that type II diabetes and variables comprising the insulin resistance syndrome are not significantly associated with tHcy concentration independent of ethnicity, and age, data from the Third National Health and Nutrition Examination Survey (NHANES III) were examined. Mexican Americans were selected for study because of the reported higher prevalence of diabetes, insulin resistance and obesity compared to non-Hispanic whites or blacks [16, 17]. Levels of tHcy were lower in Mexican Americans than in non-Hispanic whites in NHANES III [9, 18]. The study was restricted to men to eliminate the possibility of confounding by gender, pregnancy, menopause, parity or female hormone use . The study was restricted to persons older than 40 and younger than 75 years because that was the sub-sample that had an oral glucose tolerance test in NHANES III. The Third National Health and Nutrition Examination Survey (NHANES III) was conducted in 1988–1994 on a nationwide multi-stage probability sample of approximately 40,000 persons from the civilian, non-institutionalized population aged 2 months and over of the United States excluding reservation lands of American Indians. Of these, 31,311 were examined. Serum tHcy was measured only in the second half of the survey (Phase II), itself a representative sample of the U.S. population. The analyses of serum tHcy concentration in this report are restricted to 560 Mexican American men aged 40–74 years examined with valid serum tHcy and data on history of doctor diagnosed diabetes measured in the survey. The analyses of serum tHcy and fasting serum insulin are restricted to 186 men examined in the morning after fasting 9 to 24 hours with valid serum tHcy and insulin data, no history of diabetes, and not taking insulin or oral hypoglycemic agents. Numbers of persons in various correlation and regression analyses that follow may vary slightly due to differing numbers with missing values on selected other variables. Details of the plan, sampling, operation and response have been published as have procedures used to obtain informed consent and to maintain confidentiality of information obtained [20, 21]. Demographic data, medical history including doctor-diagnosed diabetes mellitus, and behavioral information was collected prior to the examination by household interview. US Office of Management and Budget race categories and Mexican American ethnicity were determined by self report . Examinations were carried out in a mobile examination center. Blood samples were obtained at the examination center. Blood in a red-top Vacutainer tube was allowed to stand for 45 min at room temperature to allow complete clotting and clot retraction. Samples were centrifuged at 1500 × g for 30 min at 4 degrees Celsius. Samples were frozen at -20 degrees Celsius. Vitamin B12 and folate in serum and folate in red blood cells were measured by the Division of Environmental Health Laboratory Sciences, National Center for Environmental Health, Centers for Disease Control and Prevention, using the Quantaphase II Folate/B12 radioassay kit (Bio-Rad Laboratories, Hercules, CA) [22, 23]. Surplus serum samples were stored at -70 degrees for 8–36 months before analysis for total homocysteine concentration at the the US Department of Agriculture Human Nutrition Research Center on Aging, Tufts University using the reverse-phase high-performance liquid chromatography (HPLC) and fluorescence detection method of Araki and Sato [22, 24, 25]. 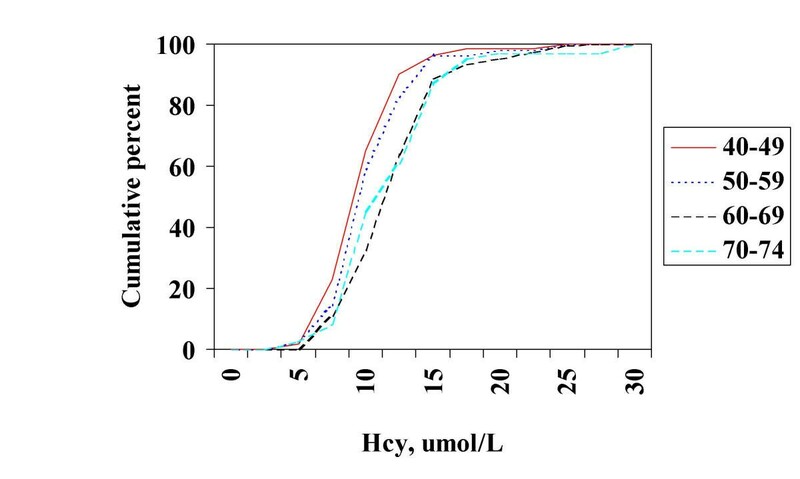 This assay measures total homocysteine, including both reduced and oxidized forms. Quality control methods are described elsewhere . Previous analyses have shown that length of time fasting did not affect tHcy concentration in this sample . Values for tHcy were missing if examined persons had no blood sample obtained or if insufficient surplus serum was available. Frozen serum was sent to The Missouri Diabetes Diagnostic Laboratory and stored at -70 C until analysis for serum insulin concentration. Insulin radioimmunoassay (RIA) was performed using the Pharmacia Insulin RIA kit (Pharmacia Diagnostics AB, Uppsala, Sweden) for the majority of samples. (Prior to November, 1990, RIA kits purchased from Cambridge Laboratories, Cambridge, Massachusetts and its successor Ventrex, Inc., Cambridge, Massachusetts were used. Based on simultaneous analyses using all three assays, results from these kits were converted to Pharmacia equivalence.) Quality control procedures included the reanalysis of 5% of specimens randomly selected either within-assay or between assay and the analysis of batch specimens consisting of four levels of control pools before and after all survey specimens. The internal reference range for fasting serum insulin in non-obese, nondiabetic adults (mean age 28.1 years) was 3.08–11.92 uIU/mL . The cross-reactivity of Pharmacia insulin antibody with proinsulin is approximately 40%. Concentration of C-peptide in serum was determined using RIA in a 3-day, batch, sequential-saturation method with two incubations . The internal reference range for fasting serum C-peptide was 0.266–1.079 pmol/mL. Frozen plasma was sent to the Missouri Diabetes Diagnostic Laboratory for determination of plasma glucose using a modified hexokinase enzymatic method on the Cobas Mira Chemistry System (Roche Diagnostic Systems, Inc, Montclair, New Jersey). Within and between-assay quality control procedures were used. During the 6 years of the survey the coefficient of variation of the method was 1.6–3.7% . Glycated hemoglobin (HbA1c) in whole blood was determined using a high-performance liquid chromatographic assay on the Diamat automated HPLC system, model 723 (Bio-Rad Laboratories, Hercules, CA). The upper limit of normal for HbA1c in this system has been defined as 6.1% . Technicians measured height to the nearest 0.1 centimeter, weight to the nearest 0.01 kg, triceps, subscapular, suprailiac and mid-thigh skinfold thickness to the nearest 0.1 millimeter and waist and buttocks circumference to the nearest 0.1 centimeter as described in detail elsewhere [20, 27, 28]. With the sample person standing at minimal respiration, waist circumference was measured in a horizontal plane at the level of the high point of the iliac crest to the nearest 0.1 cm. Hip circumference was measured in a horizontal plane at the maximum extension of the buttocks. The following were computed: waist-to-hip circumference ratio (WHR), and body mass index (BMI = weight /height2, kg/m2). Extensive descriptive data on diabetes, glucose tolerance, height, weight, BMI and obesity prevalence as well as serum tHcy, folate, and vitamin B12 in the NHANES III population have been published elsewhere and will not be duplicated here [9, 18, 19, 21, 23, 25, 28]. The plan of the present analyses was as follows. Detailed descriptive statistics and measures of association were computed initially using the Statistical Analysis System (SAS) . Pearson partial correlation was used to assess the association of the natural logarithm (LN) of serum tHcy concentration with other variables controlling for age or age and BMI . Correlation analysis results are presented because of their familiarity, ease of interpretation by a wide audience, and use in previous reports that may be compared to the present one. Multivariate logistic regression analysis was used to estimate models for controlling for confounding of the association of LN serum tHcy with history of doctor-diagnosed diabetes mellitus . Linear multivariate regression analysis was used to estimate models for controlling for confounding of the association of LN serum tHcy with fasting serum insulin . Only variables with pre-specified hypotheses were entered into the regression models. Following these preliminary analyses, analyses were performed using techniques that incorporated sampling weights and design features of the survey [29, 30]. Population estimates for means and percentiles of variables were produced using weighted SAS or SUDAAN procedures . Pearson correlations of LN serum tHcy with other variables were performed using SAS weighted analysis and all statistical testing and variance estimation were performed using the PROC LOGISTIC and PROC REGRESS procedure for regression models in the SUDAAN system [23, 24]. Figure 1 shows the distribution of serum tHcy concentration by age. As reported previously, the distributions show rising levels in each decade of life from the fifth through seventh decades. Perhaps due to smaller sample size and increased variability, no further increase was apparent in men aged 70–74. LN serum tHcy was correlated with age overall (r = 0.26) but not within decades with the exception of the sixth (r = 0.26). The distribution of HbA1c varied little with age (not shown). The cumulative distribution of fasting serum insulin concentration showed little variation with age until the seventh decade (not shown). Blood pressure showed a consistent, graded change with increasing age. Cumulative distribution of serum total homocysteine in Mexican American men aged 40–74 years in the Third National Health and Nutrition Examination Survey, 1988–1994. Mean natural log (LN) tHcy was computed in cases with a history of doctor-diagnosed diabetes and in controls with no such history. No relationship was found between mean natural log (LN) tHcy and diabetic status before (diabetes 2.27, no diabetes 2.26) or after (2.26, 2.31, respectively) adjusting for age. Nor was age-specific quintile of tHcy significantly associated with diabetic status. However, mean LN serum folate was significantly higher in diabetics after age adjustment (age-adjusted mean LN folate diabetics 2.56, non-diabetics 2.42). In all men within age groups, LN tHcy was not correlated with HbA1c concentration (e.g. at age 60–69 r = -0.02). In a weighted logistic regression analysis controlling for age and BMI in men aged 40–74, LN tHCY was not significantly associated with prevalent diabetes (beta coefficient -1.018, SE 0.676, T -1.505, P = 0.146). Within strata of age and overall, weighted correlation coefficients were computed of LN serum tHcy concentration with variables associated with the insulin resistance syndrome as well as vitamin levels. In combined fasting and non-fasting Mexican American men with no history of diabetes, LN tHcy was not associated with glycated hemoglobin, HDL cholesterol, blood pressure, waist-to-hip ratio, waist circumference, and body mass index. For example for glycated hemoglobin correlation coefficients by age were as follows: 40–49 y 0.14, 50–59 y -0.16, 60–69 y 0.11, 70–74 y 0.04. LN serum tHcy was highly negatively correlated with serum and red blood cell folate (e.g. r = -0.48, -0.39, respectively at 40–49 years), and serum vitamin B12 concentrations (e.g. r = -0.29 at 40–49 years). Table 1 shows means by age of tHcy and other variables in the subsample of fasting men. Blood pressure showed a consistent, graded change with increasing age. In the subset of fasting men aged 40–74 with no history of diabetes, Pearson weighted correlation coefficients within strata of age and in all men were computed for LN serum tHcy concentration with fasting blood measurements of insulin resistance and glucose tolerance (Table 2). In partial correlation analysis controlling for age in fasting men aged 40–74, LN tHcy not associated with fasting serum insulin, C-peptide nor plasma glucose (e.g. for LN insulin r = -0.004). Nor was tHcy correlated with values at two hours post glucose load nor with serum triglycerides (r = 0.04). Analyses within age strata are shown in Table 2. Mean levels of serum tHcy and indicators of insulin resistance in fasting Mexican American men. F, fasting; SI, serum insulin; SG, serum glucose; SCP, serum C-peptide; tHcy, total serum homocysteine; TG, serum triglyceride. Correlation coefficients of LN serum tHcy with serum indicators of insulin resistance in fasting Mexican American men. LN, natural log; FSI, fasting serum insulin; FSG, fasting serum glucose; FSCP, fasting C-peptide; tHcy, total serum homocysteine. A weighted linear regression model was fit with fasting serum insulin concentration, the best measure in this survey of insulin resistance, as the dependent variable and LN serum tHcy as the exposure variable controlling for age, and BMI in the subset of fasting men aged 40–74 with no history of diabetes. Serum tHcy was not associated with fasting serum insulin (beta coefficient -6.217, SE 6.171, T -1.007, P = 0.324). However an interaction of age and tHcy was apparent and the analysis was repeated for men 40–59 and 60–74. No significant association was seen at age 40–59 (beta coefficient -0.101, SE 0.141, T -0.717, P = 0.481. However at age 60–74 a borderline significant positive association was seen (beta coefficient 0.205, SE 0.098, T 2.078, P = 0.049). Few studies have examined the relationship of total serum homocysteine concentration and diabetes, increased serum insulin concentration or insulin resistance, despite the relationship postulated for all these variables with coronary heart disease and atherosclerosis [1–6]. Some studies report higher tHcy in persons with type 2 or type 1 diabetes than in non-diabetics [7–9], while others do not [10, 11]. One small study of Dutch healthy volunteers reported independent associations of tHcy with glucose utilization measured using a hyperinsulinemic euglycemic clamp, the best indicator of insulin resistance . However, another somewhat larger study of tHcy and insulin-mediated glucose disposal failed to find any association . An Israeli study reported a negative correlation of plasma tHcy and insulin levels . Well established are associations of metabolic risk factor clustering with insulin sensitivity and hyperinsulinemia, the insulin resistance syndrome [4–6, 15]. Mechanisms for a putative association of tHcy with diabetes mellitus or insulin resistance are unclear. Homocysteine is elevated in severe diabetic nephropathy as in other forms of chronic renal failure, perhaps due to decreased glomerular filtration rate, and pre- and intrarenal factors [32, 33]. Acute hyperinsulinemia during a hyperinsulinemic-euglycemic glucose clamp seemed to lower tHcy in normal controls but had little effect in Type 2 diabetic patients in a small study . Folate, vitamins B12 or B6 are not among micronutrients shown to affect insulin sensitivity . However, folate and vitamin B12 are inversely associated with tHcy in Type 2 diabetes and tHcy is associated with cardiovascular disease in Type 2 diabetes . A study of Dutch diabetics failed to show clustering of tHcy with other risk factors of the insulin resistance syndrome [36–39]. NHANES III was the first study to provide population-based data on distributions of tHcy in Mexican Americans [25, 40]. Concentrations of tHCY in serum were lower in Mexican Americans than in non-Hispanic whites or blacks. As in these other groups, tHcy increased with age and was higher in men than women in Mexican Americans. However, no published data were found on associations of tHcy and cardiovascular risk factors of the insulin resistance syndrome in Mexican Americans. In the total NHANES III sample, tHcy was inversely associated with education years, and serum folate and B12 concentrations and directly associated with smoking, systolic blood pressure, total serum cholesterol, and history of diabetes . In a Norwegian population, similar associations were reported in addition to finding an inverse association with physical activity in leisure time and a direct association with plasma triglyceride concentration . In a Japanese case control study, plasma tHcy levels were higher in Type 2 diabetes with macroangiopathy than in diabetics without macroangiopathy or non-diabetic controls . Levels of tHcy also were higher in diabetics without macroangiopathy than in non-diabetics, significantly so in women. Another study failed to find elevated tHcy in Type I diabetics without nephropathy . A Dutch population-based study showed no significant variation in tHcy among those with normal or impaired glucose tolerance or NIDDM . However, tHcy was more strongly associated with prevalent cardiovascular disease in persons with Type 2 diabetes than in others. For unknown reasons, in 22 pregnant Finnish women with pre-eclampsia, tHcy was strongly correlated with insulin sensitivity (r = -0.51, p = 0.02) and area under the curve of the first 10-minute insulin levels (r = 0.62, p = 0.002) during the insulin-sensitivity test; no such correlations were seen in 16 pregnant control women . Many studies report the strong association of tHcy with serum folate, and vitamin B12 levels. Limitations of the present study include possible bias arising from survey non-response and from missing values for some variables. However these are unlikely to seriously compromise the validity of the study [30, 45–49]. Results may not be generalizable to other ethnic groups. Future research should include longitudinal studies of insulin resistance syndrome and serum tHcy, and vitamin levels in non-Hispanic white and black and Hispanic men and women to determine temporal sequence of any relationship. Euglycemic clamp, minimal model or other techniques for accurate measurement of insulin resistance and specific insulin assays should be used to confirm whether insulin resistance, fasting specific insulin and proinsulin vary in their association with serum tHcy. Insulin resistance and serum tHcy should be assessed jointly as risk factors for development of noninvasively measured atherosclerosis (e.g. carotid intima-medial thickness) in non-insulin dependent diabetes and insulin dependent diabetes. In conclusion, in a national sample of Mexican American men aged 40–74 years, serum tHcy was not associated with prevalent diabetes mellitus, body fat distribution, obesity or other variables of the insulin resistance syndrome. Serum folate concentration was higher in diabetics than nondiabetics and was negatively associated with serum tHcy. Fasting serum insulin concentrations also showed no consistent associations with serum tHcy levels overall or within age subgroups. We acknowledge the staff and contractors of the Division of Health Examination Statistics of the National Center for Health Statistics, Centers for Disease Control and Prevention, who conducted the survey and prepared the data for analysis.